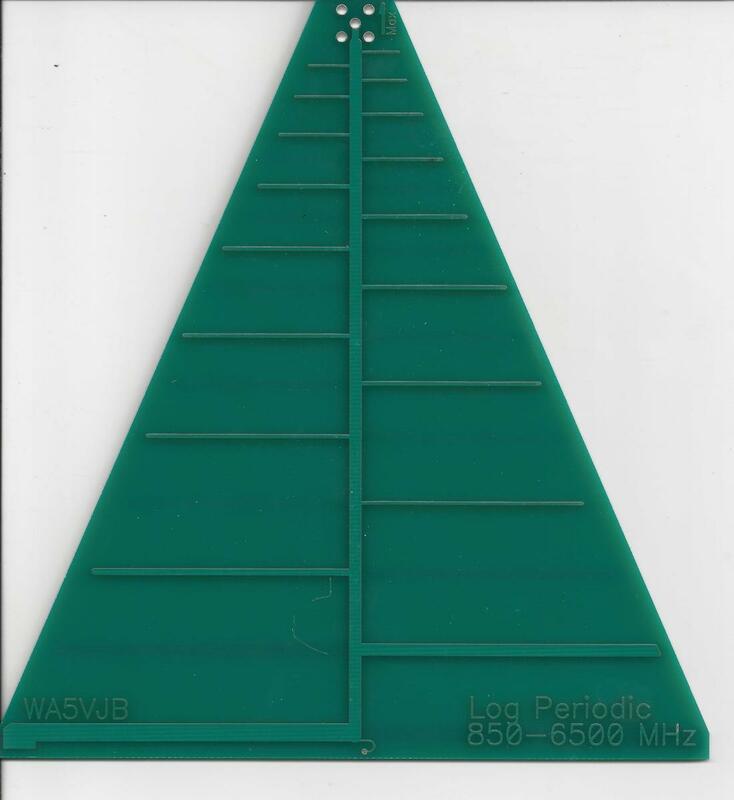 How can you use a 400-1000 MHz log periodic printed circuit board antenna? 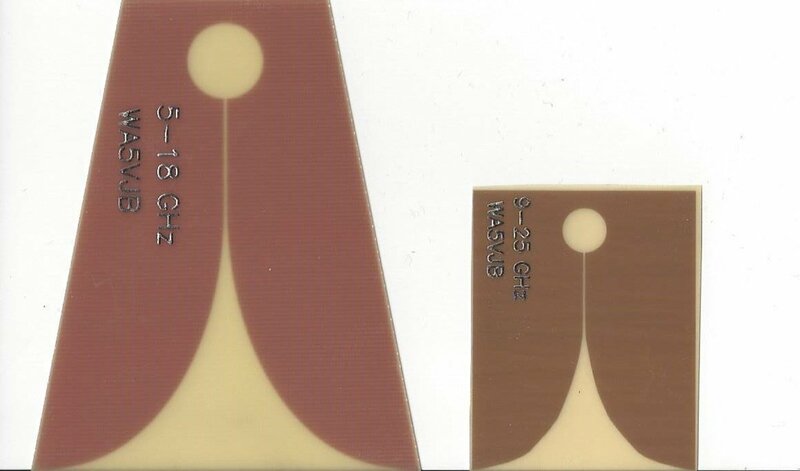 The log periodic printed circuit board antenna or LP PCB antennas in the 400 to 1000 MHz frequency range have a variety of uses, only a few of which fall under FCC rules. 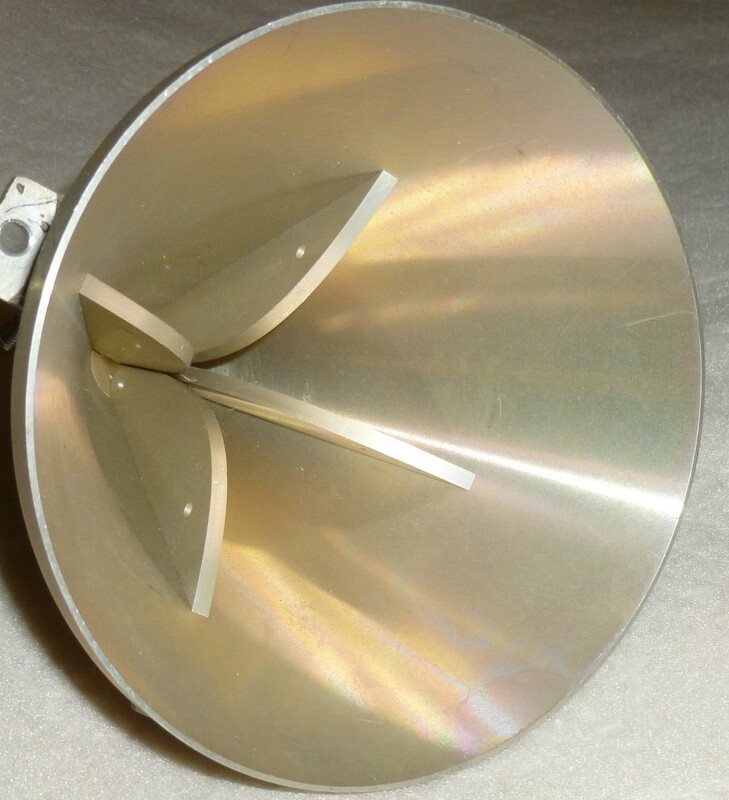 The 400-1000 MHz log periodic antenna can be used for Ultra High Frequency or UHF HDTV signal reception. These antennas are regularly used for wireless microphone applications, scanners and wireless LANs. The Kent Electronics brand 400-1000 MHz LP antennas were used on the set of Avatar for picking up wireless microphone signals. Glue a piece of wood or fiberglass to the back edge of the antenna then drill that for a microphone stand to be able to attach it to a pole without affecting its signal reception. 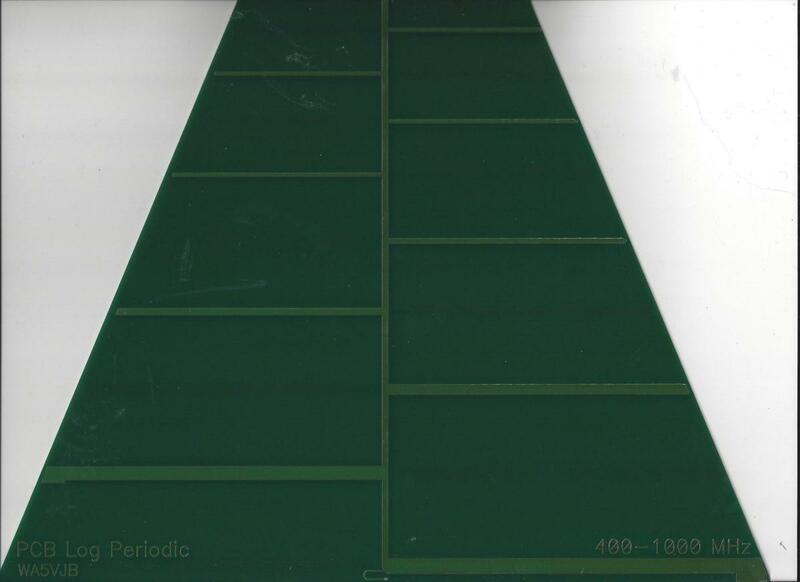 Log periodic PCBs in the 400-1000 MHz range can be used as feeding reflector antennas. If you are a ham radio operator, these PCB antennas work well on the 70 centimeter ham band and dual band radios. These antennas may be used in VHF/UHF utility monitoring and RF measurements in the field. This design can be used for both transmission and reception. 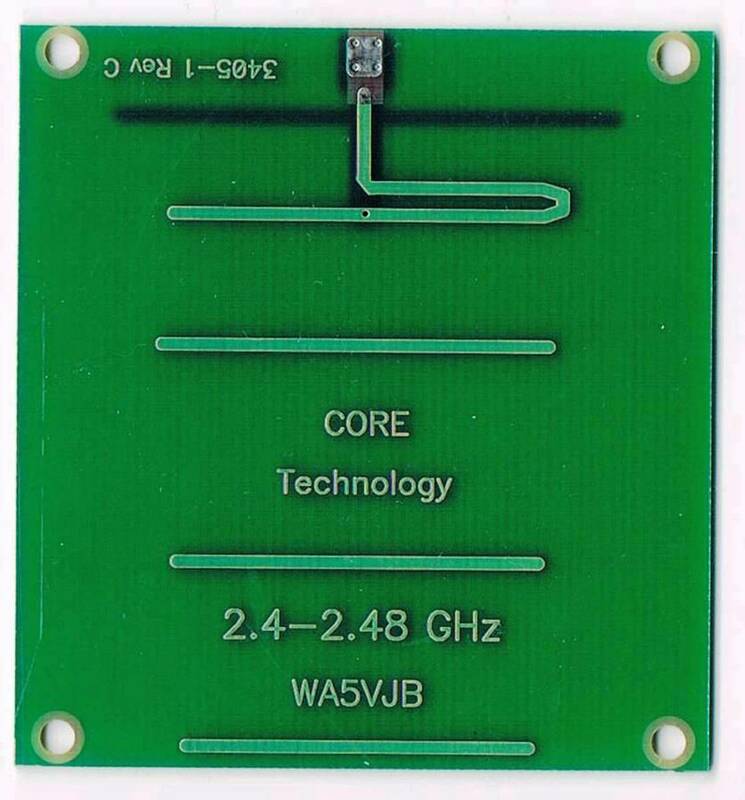 The trapezoidal printed circuit board concentrates the beam into a signal four times as powerful when used in broadcasting. How do you mount a log periodic printed circuit board antenna? The PCB footprint is for the standard SMA connector. Either a straight or 90 degree right angle can be used to mount this antenna. However, the connector should be on the side with the larger ground area. You can also solder coax directly to the antenna if you like, though coax should be routed along the boom of the antenna. Cutting the embedded element affects its performance. You can drill mounting holes through the fiberglass between the elements on the antenna. The best place to attach a mount is the back-center area of the log periodic printed circuit board antenna. Wood, sheet plastic, and most any non-metallic material can be used as mounting. Don't attach it to a metal mount, since this alters its performance. Then you can have your bracket attached to the wood or plastic. The antenna works with frequencies down to 400 MHz. If you are only using channels above 500 MHz, then you can sacrifice the longest element by drilling through it when mounting the antenna. For example, those working on the set of the movie Avatar just drilled holes in the longest element and mounted Kent Electronics 400-1000 MHz antennas at that point. Doing this messes up reception in the 400 to 500 MHz range, but not higher frequencies of 500 MHz to 1000 MHz / 1 GHz. Can you apply a protective paint to these antennas? 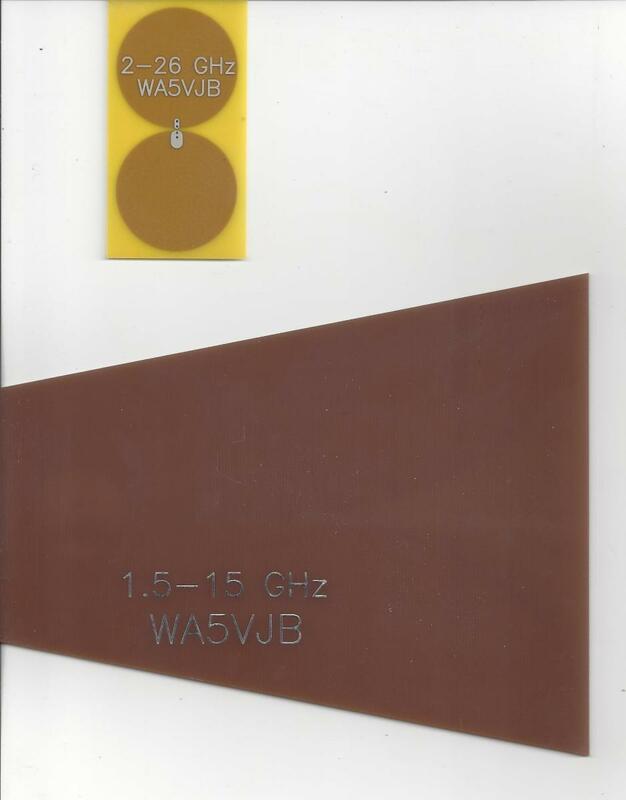 You can paint Kent Electronics 400-1000 MHz LP PCB antennas black or another color. The brand and type of paint makes no difference. The metallic paints are generally not electrically conductive. Use enough paint to get the desired color, but no more. Paint changes the frequency of the antenna a little bit. So the 400-1000 MHz becomes 390-980 MHz, but still works fine with wireless microphones, for example. Some users have had limited success dipping them in plastic coatings, but this is not recommended by the manufacturer. If you don't want to paint it but do want to make it unobtrusive, you can cover it with a light-weight, non metallic fabric. Are there any limitations to using 400-1000 MHz PCB antennas? 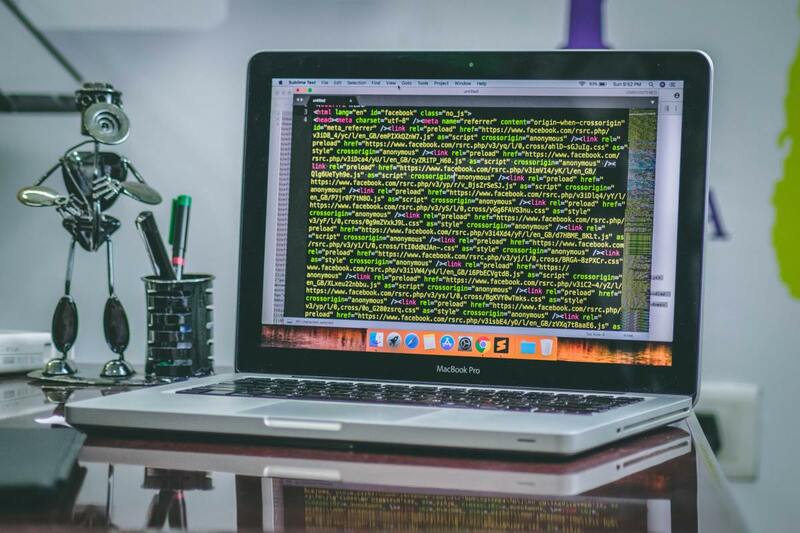 If you want to use a 400-1000 MHz PCB antenna as a signal booster for your cell phone, know that you need the consent of your cell phone service provider to do so, and not all providers allow you to do so. While signal reception rarely runs afoul of the law, the FCC limits signal broadcasts in some cases, especially when it interferes with the communications of others or licensed broadcasters. Note: If you use these antennas as a signal booster for your cell phone, the triangulation function used to locate where your cell phone is located when you place an emergency call may not work correctly. If your radio is designed to feed DC voltage up to the antenna to power a preamp, then you can cut the delay line with a sharp knife. This is an issue with some wireless mic systems. If not, you'll find the antenna works pretty well for a DC short. What would be the best way to split signals with this antenna? Your best bet would be one of the amplifiers used to split TV signals if you want to split the signal three or more ways. You could use a distribution amp. The antenna will be quite happy in a 75 Ohm system, but you will probably need F to BNC adapters at the radios. Do I need an amp to boost the signal? Gain is something you always have to be careful with. You are better off if the amp is near the antenna. You could possibly utilize a single stage amp with 10-15 dB of gain when the antenna is 30 feet / 10 meters away. However, if passive works, you are always better off. What if you need to adjust the gain? There are many ways to do a gain adjustment, and many of those reduce sensitivity. Having the amp at the antenna works best, but there might be issues sending DC back up the coax to a DC shorted antenna. 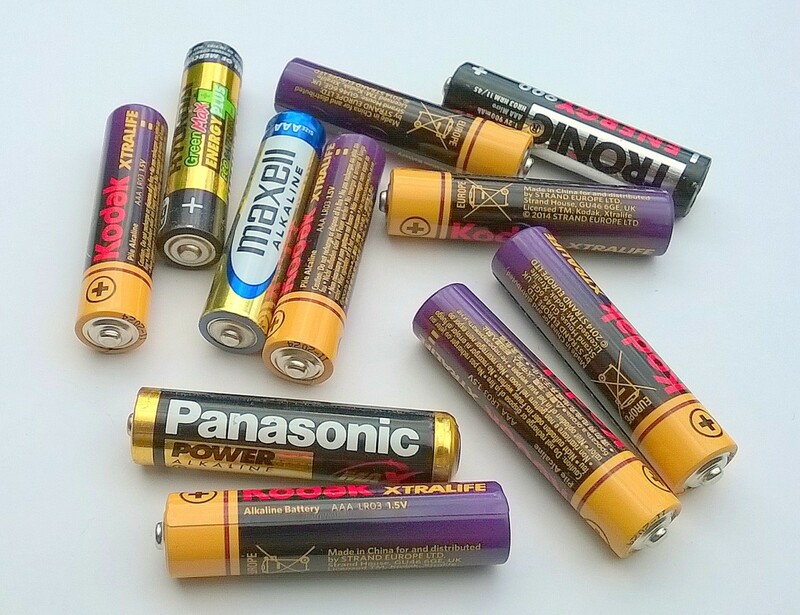 Some amps pass along the DC voltage, but some do not. If I attach one LP PCB antenna to a transmitter like USRP, and another one as a receiver, to transmit information such as a song, do the posture of the two antennas affect the outcome? The sharkfin antenna is directional. Point the narrower end in the direction you want the signal to go. However, there is no other limitation. You can have either side of the trapezoidal antenna "up," and it won't affect performance. In regards to a printed circuit board, how do I route the coax to receivers, and how many receivers will one unit service? When you split the signal to go to two receivers, about 40% of the signal goes to each receiver. The other 20% is lost. Split again, and each of the 4 receivers gets 40% of the 40% or just under 20% of the signal. So, it gets weak fast. If signals are very strong, this is not a problem. Another solution is to use a amplified splitter. Since most wireless microphones share the UHF TV channels, the antenna splitters used for TV signals work fine. This 400-1000 MHz antenna works well into 72 Ohm TV coax and amplifiers. You can use metallic hardware as long as it doesn't touch the metal traces on the antenna. You ideally want to be at least a quarter inch away from the nearest trace. Standard epoxy glue is fine, again, avoid contact with the metal trace. Most Log Periodics have a high impedance. The Balun or Transformer is converting 200-300 Ohms down to 50 Ohms. The PCB Log Periodics are designed to have a much lower impedance and sort of wander between 50 and 60 Ohms over the frequency range. They are designed for a direct 50 Ohm match, no balun or ferrites are necessary.